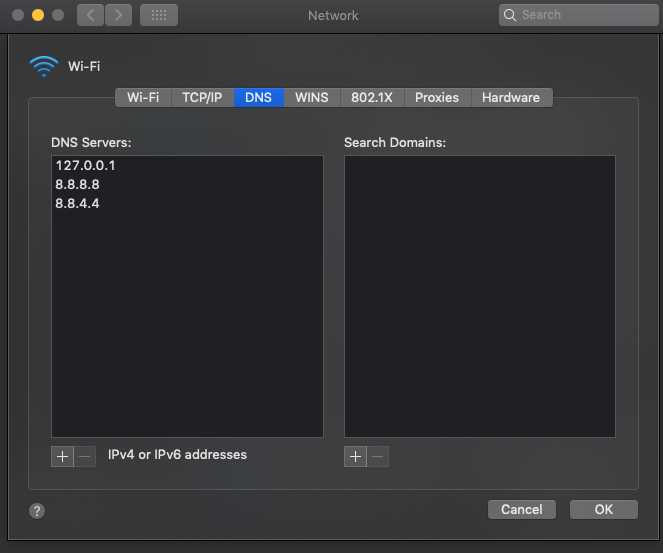 This is a guide how to use Consul’s DNS service from your local macOS machine. If you have any issues here you have to resolve them before going forward, in case you are getting timeouts or other errors this might mean that for example your consul service isn’t accessible from outside the cluster, you have some firewall rules in place or other issues. After verifying that everything works by hand we can start plugging the pieces together to make it all work automatically. If you are asked about permissions to launch services at system start time, you have to approve it. The command above verifies the DNS resolution and uses locally running dnsmasq explicitly, you should receive the A record as in the previous output. I have added 127.0.0.1 at the top which points to the dnsmasq running on my machine. See that now we don’t have explicitly choose DNS server, the DNS servers are taken in order from the system-wide settings. Which confirms that everything works OK. In this guide, we have started dnsmasq on our local machine and configured it to forward all requests for .consul domain name to the consul DNS service. We have also updated our system-wide settings to always use this instance of dnsmasq as first priority DNS server. By forwarding all .consul domain names to Consul DNS you can use all services resolved by Consul as if you were part of the cluster.